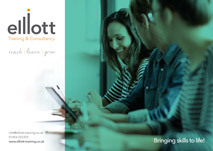 At Elliott Training we believe that at the heart of any business there must be a focus around culture, passion and the desire to make a difference. It is our fundamental belief that an organisation is only as good as its people. Creating a balance that combines the correct depth and blend of skills is fundamental to the achievement of goals within your business. We align all our programmes to your organisational values, culture, vision and strategy; making sure you have the right people, with the right skills at the right time. We have a wealth of experience gained from our extensive work within Management and Leadership. We will work closely with you to identify the successes, strengths, best practices and gaps that are delivering current results before putting together a programme to address area’s where improvement in skills, behaviours and knowledge can be encouraged. Our approach to training and development is to make a difference. We develop programmes that inspire people to think differently, behave differently and continue to make a difference when they return to the workplace. The following is a flavour of our existing training courses, and of course programmes can be designed specifically for your needs. If you’d like to inquire about a tailor-made course please email us here. "Sophie, you did an amazing job at engaging the audience with interesting content and humour. None of the colleagues in the room was left behind and the amount of questions they had, once again proves how thought-provoking the session was. All bearing in mind that this was a very light touch approach to the standard half day or more EI training that you deliver. It was evident that a lot of passion went into today and we deeply appreciate that." "I just wanted to let you know that the training with Jacqui yesterday went really well, we were really pleased with the quality and content of the training. It was spot on and exactly what we wanted for our team. Jacqui was bubbly and confident and really worked hard to make everyone feel comfortable. It was a huge success and I just wanted to pass on my thanks to Jacqui and yourself for all your hard work and assistance in making yesterday happen for us. We really got a lot out of it and learned a lot that we can apply to our everyday roles." "I thought it was a very useful day. Mike has already feedback he has used some of the tools on his team to great effect!" If any of our courses are of interest to you please get in touch with our team today to have an initial discussion about your requirements. Call us on 01454 203355 or drop us an email.